It goes without saying that the natural environment plays an important role in mitigating climate change and keeping Earth as the hospitable place that it is for us humans. It's hard to know for sure the effect that one species can have on the environment, but the rapid removal of one species from the ecosystem can have complex and unpredictable effects on its ecosystem counterparts. The Rhino (Ceratotherium species) is a keystone species - this means that the activities of the Rhino and the mere presence of the Rhino in the ecosystem is important for the survival of other species and the balance of the ecosystem. If the Rhino is suddenly removed, it will have far reaching consequences for other species in the environment, and could disrupt the delicate balance of the ecosystems where these animals exist. As an example, White Rhinos are responsible for maintaining "grazing lawns", which is beneficial to grazers like wildebees, zebra, and impala. and therefore they also assist in maintaining the balance between trees and grasses which is what makes a savannah a savannah. This year alone, 688 Rhinos have already been poached in South Africa. 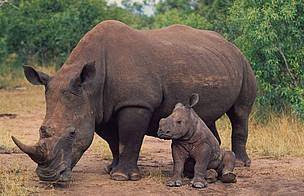 Please lend your voice, or just a tweet, to WWF South Africa http://www.wwf.org.za/, to support their initiative to raise one million tweets in support of saving the Rhino in South Africa. Tweet #iam4rhinos!